So far, 2018 has been the year of the lava lamp. Last week, we talked about the trippy new one from Jeremy Morris and The Lemon Clocks. 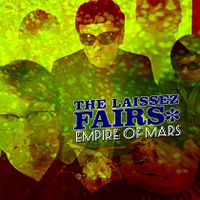 Now, The Laissez Fairs up the ante with Empire of Mars. The Laissez Fairs are John Fallon and Joe Lawless and they draw their inspiration from the 60’s bands such as Pink Floyd, The Byrds, The Beatles and The Stones. If you cut your teeth on 80’s music, Jeff Kelly and Green Pajamas may be a better frame of reference. The opening track, “High Horse”, sets into a groove that sounds like a hybrid between a Revolver cut and something from The Green Pajamas’ Book of Hours. Since those are two of my favorite albums of all time, you can understand why I was already feeling no pain and ready for one helluva ride. If you know from the reference in “Like Mrs. Peel in Leather”, then you’re old enough to completely get how effectively Fallon and Lawless have captured the 60’s psyche-pop sound. Short and sweet ala The Who or The Godfathers, “Silhouette Suzy” has the kind of drive that makes for a most engaging experience. And, if Fallon smoked a couple packs a day, his vocal delivery on the title track could sound like Richard Butler of The Psychedelic Furs (who were psychedelic in name only). Then, “Higher Than You Meant to Go” sees the band effectively channel The Rolling Stones. The Laissez Fairs have crafted an extremely good psyche-pop album here. Get your copy in digital form at their Bandcamp page or get the physical CD from Kool Kat Muzik.